Andrew Camardella slugged a grand slam in the second inning that proved to be the difference in a 7-4 victory for the Midwest Haymakers (7-3) over the Washington Bluesox (4-4-2). The Haymakers would be done scoring after getting to Bluesox starter Nathan Kroell for seven runs in the first two innings. While Kroell struggled Isaiah Bell was dominant and clutch, throwing three innings of no run ball that allowed the Bluesox offense to wake up and slowly chip into the 7-0 deficit. A three run fourth inning for the Bluesox turned the game into a competitive contest but would be as close as they would get. The Bluesox stranded five base runners in the final three innings. 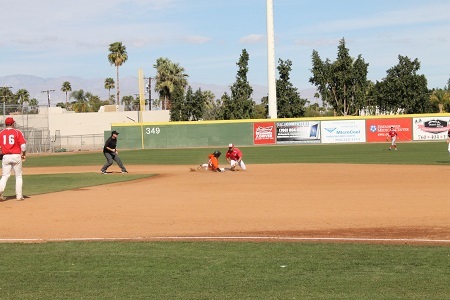 The Palm Desert Coyotes took a commanding 9-1 lead over the Palm Springs Chill in game two at the auxiliary field. Nathan Tomaszewski hit a grand slam in the second inning to give the Coyotes a 6-1 lead. The Palm Springs Chill would comback as Austin Rauch hit two homeruns driving in three runs. The big inning for the Chill was the bottom of the sixth as they batted around and scored six runs. The final score would be 10-9 in favor of the Palm Springs Chill as David Teasley would pitch the sixth and seventh to get the win. The game was close throughout as the action was started in the first inning. The Snowbirds scored two runs by way of an error by second baseman Derek Hagy. The Bombers answered in the second with a two run homerun off the bat off Tim Leary. In the end it would be the Bombers winning, thanks to a walk-off sacrifice fly from Bobby McCormick in the bottom of the seventh inning. The final score was 5-4 and marked the Bombers third consecutive win. Ken McDowell consistently pitched himself into trouble in his debut for the Bootleggers. More importantly for his tem, he was able to pitch himself out of trouble. McDowell stranded 11 runners in five innings of shutout ball and gave his team an opportunity to win. That opportunity presented itself in the sixth inning when the Bootleggers began a two-out rally. Nick Latta reached base with a single and Alan Cheatam followed with a single to left that was mishandled, allowing Latta to score all the way from first base. It was the only scoring of the game as Hayden Shirley slammed the door shut in the 7th to earn the save. A’s starter Griffin Jones was dominant in a six-strikeout performance through five shutout innings, but a lack of run support handed him a no-decision. The Bootleggers held on to first place improving to 7-2-1 while the A’s fell to 4-5-1.